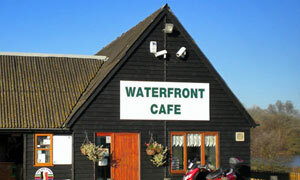 Although this actual visit is not in the "Light Lunches" mode, a light lunch can be obtained in this waterside cafe. We had been twice before, and on one of those occasions my husband's lunch had been forgotten and he ate his after I had practically finished mine. This fact notwithstanding, we decided to go again and do an "official" review as the food is fine. On a sunny day like today, it is a very pleasant location. The lake is only a few yards away and looked quite blue for a change. We managed to have a table in the sunnier part of the cafe, and our meals arrived after a fairly short wait. The menu is quite extensive, jacket potatoes and burgers along with various pies, sausages, fish and chips, soup and "breakfasts". I had chicken breast with mash, peas, carrots and a Yorkshire for £4.95, and my husband had a steak and kidney pie with similar accompaniments for £3.95 which we thought pretty reasonable. The food was hot and plentiful and with two teas the bill was £10.50 so not bad. Now the downsides, which are fairly minor! Having pulled out the teabag from the mug, there is nowhere to put it, so it has to sprawl wetly on the table. The other point is that the chairs are not straight-backed and so it is very awkward to get "into" the table when there are people at the next one. It seemed impossible to do so today without vaulting over the table itself, and we had to sit elsewhere until the "sunny" table became free with a bit more space. There are newspapers to borrow and the staff are friendly. Just change the chairs! If it was a car -- ???. If they were passing by -- "someone with simple tastes".